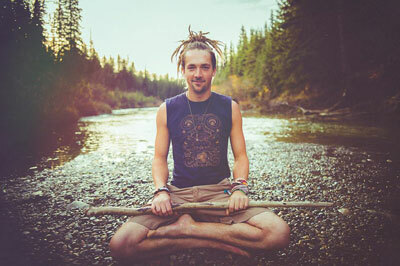 Throughout the ages, civilizations have recognized and honoured our sacred connection to the elements. It is through these elements our world and our very existence is created., From the ancient Mayans to the Indigenous peoples of North America, cultures the world over have integrated the power of the elements into their communities and individual lives. This fundamental knowledge is what connects all people together and what connects us to our home. Earth is our bodies, water is our blood, air is our breath, and fire is our spirit. We are made of the Earth and the Earth is made of us. Understanding, honouring, and integrating this essential knowledge is what will re-connect us to our true essence. 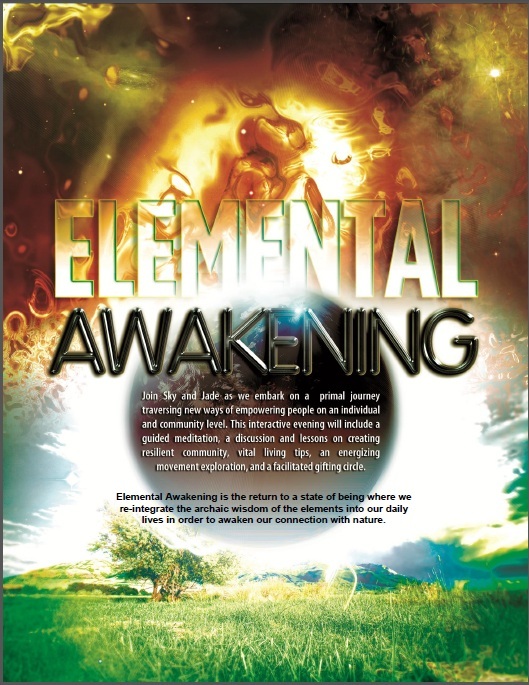 Elemental Awakening is the return to a state of being where we re-integrate the archaic wisdom of the elements into our daily lives in order to awaken to our connection with nature. Saving the Earth begins with the understanding that we are one part of the Earth, as our heart is one part of our bodies – connected and working as one. Treating the Earth as separate, as a source of resources to be exploited, is what has fed the crises we are facing, and the solution is to re-connect as one. Balancing our relationships with the passionate energies of fire, the cleansing personality of water, the free flow of the life giver air, and the grounded stability of earth will give us the power to save this planet. History is ending because the dominator culture has led the human species into a blind alley, and as our civilization enters deeper into the converging crises, we look for metaphors and answers by casing our gaze into the past, looking for the last sane moment we ever knew. And the last sane moment we ever knew was on the plains of Africa – a moment before history, before standing armies, before warfare, before slavery and property, before, before, before. And this is where the future is taking us. Because the secret faith of the 21st century is nostalgia for the archaic. This is what gives us body piercing, abstract expressionism, surrealism, jazz, rock and roll, and festival culture. The 21st century mind is nostalgic for the free flowing paradise that once existed before our separation from nature. The way out is the way back and the future is really a forward escape into the past. What we are looking for is a return to the archaic. If the community understands what holds it together, then the community will be better prepared for the leap forward through this evolutionary learning process. What we need is a new myth. What we need is a new true story that tells us where we are going in the universe. The glue that holds the community together is the felt presence of shared immediate experience. And the dominators, the materialists, the product peddlers are not interested in what holds the community together because nobody can sell that to you, and nobody can buy it from you. The mystery is in the body and the way the body works itself into nature. Getting it all reconnected means putting aside the idea of separateness and self-definition through “thing fetish” – getting it all reconnected means tapping into the Gaian mind to reset the compass. And that’s the idea – that we are figuring out how to reset the compass of the self through community, through ecstatic dance, through sexuality, through intelligence – this is what we have to have in order to make the forward escape into a paradise limited only by our imaginations. And so as we feel this longing to belong build steadily, this pull toward re-connection, we start to look around us for a deeper sense of fulfillment; the temporary material fixes no longer satisfying us the way we require. As the drums of ancient tribes and the call from our ancestors to return home resound through our very fabric. Together in community we begin to feel connected, loved, and part of a greater universe. Music, dance, and celebration merge us with space and time as this unifying state of bliss begins to permeate our everyday life. A positive movement, calling us to return to a simpler life, driven by the desire to share love, laughter, and excitement begins to reignite community as we start to experience understanding, acceptance, truth, and fulfillment at the highest level. A new reality is born through the return to a global community. Hey would you mind letting me know which web host you’re working with? I’ve loaded your blog in 3 completely different web browsers and I must say this blog loads a lot faster then most. Can you recommend a good hosting provider at a honest price? Thanks a lot, I appreciate it!